Love to crochet some blanket for babies and home, be sure to check out the list of 40+ DIY Knit & Crochet Baby Blanket Free Patterms. Daisy flower is popular both for gifting and growing in gardens. And loved by many parents for baby gift making. 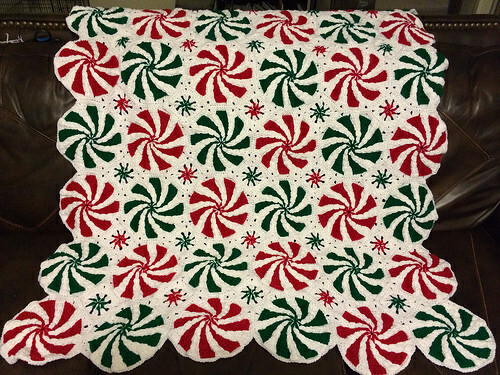 The Crochet Peppermint Afghan is one of best choice for home or gift delivery for the coming holidays. This cool crochet pattern helps you create a giant peppermint afghan that would look great on any chair or bed. What a delicious way to dress up your home for the holidays! The peppermint motif is very cleverly designed with a smaller filler motif. To complete the look, we’ve included a peppermint pillow. Easy to follow instructions make this blanket pretty easy for anyone that knows how to crochet. Enjoy your handmade cozy throws.